Are you searching for green forests in and around Mumbai? Looking out for a one day trek place or a picnic spot in Mumbai? If you want to spend a day walking, or cycling or trekking or watch the flaura and fauna right here in Mumbai: Yeoor hills is an ideal getaway. 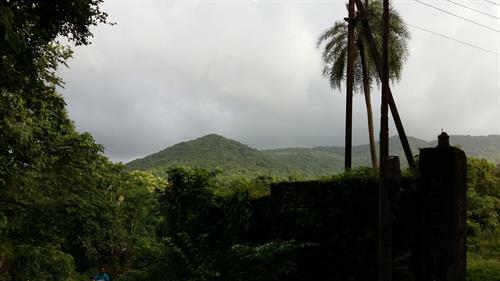 Get you family or friends and enjoy the wonderful lush green forest of Yeoor hills amidst the concrete jungle of Mumbai. It was a good day last Sunday, with a light drizzle to set out for a visit to Yeoor Hills. I had heard about this place often in the last twenty five years. We were supposed to go to do some social work at this place and share some knowledge with the villagers and their children and encourage them to go to school. Often this place has been in the lime light for leopards, coming into the villages and killing or injuring the inhabitants. Since then, I had never got the opportunity to visit this place. Yeoor is located near Upavan, in the Thane district in Maharashtra, and it well known for its flora and fauna among the nature lovers for school education trips, walks, treks, and bird watching. It is a buffer zone at the other end of the Sanjay Gandhi National Park which is also known as National Park and is visited by nature lovers for panthers, wildlife and forests. What makes it attractive for Mumbaites and specially Thaneites? It is the clean atmosphere which rejuvenates you and is within Mumbai. Yeoor hills is well connected to Thane. You can take the Patonpada bus route from Thane station, of come form Pawar Nagar or 110 bus route from Mulund. You can travel by your own private vehicle or by auto rickshaw to Yeoor. This area also has many bungalows owned by the wealthy and the ministers. We entered into Yeoor from Upavan side by car and drove right up to the Patonpada, the last village. My hubby carried a cycle in the car to enjoy the climb and back. We drove into the forest, the road is concrete and climbed the mountains. On the sides of he road there are many hotels and resorts amidst the lush green forests. The place is ideal for cycling or walking. People from Mulund and Thane, come for a walk to this place. It is a good meeting point for friends and family, with a Sunday morning picnic. The areas of Yeoor comprises of six small villages with an approximate population of around 3000. These villages are quite traditional. Majority of the village population comprises of adivasis who earn their livelihood by cutting wood and selling regional fruits, growing rice and fishing in the nearby dam and. The income range of the villagers is between 10,000 to 20,000. I had an hour long walk around the villages and could see the hospitals in the village area but they were not modern. The villages had proper sanitation facilities The villagers depend on For treatment, the people have to come downhill to Vartak-Nagar area or Upavan area. The local village is quite under-developed with no electricity in the last 2 villages. Also the area has Municipal School with classes up to 9th grade. The villages have a primary school but the population literacy is low. The entire village area has access to MTNL, Dolphin, Airtel and Vodafone networks. There are many resorts and hotels along the main road. You can stay for a day or two or relax for a day in the resorts and they are reasonably priced. With no rains or just a light drizzle people come to this place to walk or cycle. I saw a lot of cyclists moving around and enjoying the drive on the hills. Yeoor is known for its good terrain with steep slopes and ideal training area for long cycling trips. I enjoyed a long walk along the main road, which had many by-lanes leading into the rice farms or the woods. Some roads just ended into the forest. There were many people walking along the road, some alone like me, while others with friends or family. I found myself walking, peeping into the adjacent rice fields, or the green grassland, and I could vividly picture the grasslands of New Zealand. In India there are many places: as and more beautiful than abroad, then why do we want to travel abroad without seeing many places in India? At that very moment I vowed that I would see more of India, before thinking of traveling abroad. The area of Yeoor hills is serene, green and silent. A perfect way to relax, feel fresh and keep breathing the fresh air! While taking a walk and during the trek I came across trees like bamboo, boar, apple, mango, Nilgiri, tamarind, lotus, jackfruit, almond, amla etc. During my interaction with the villagers and children I came to know that many parents do not send the children to school. Looks like next time I come I will plan to spend sometime talking to and convincing the villagers to allow their children to go to school. After my spouse returned from cycling we decided to trek into the forest. About five minutes walk from the last bus stop, the road ends abruptly and you can see a walking trail which disappears into the forest. We took this road and it went deep into the forest, up and down many mountains, crossing few small streams. Overall it was a light trek. The path was quite broad, sufficient for two people to walk together. It was a green forest, with butterflies fluttering around on the wild flowers and the bushes. The sun came and went and frequent light drizzle made the weather very pleasant. The hills are covered with greenery and at some places you can hardly see the sun above. The trek is quite simple and no way of getting lost. Enjoy the flora and fauna on the way. After an hour of walk, you come into the open in a valley, quite a big stream flowing, you can wade and cross over to the other side and walk further to a waterfall. This is the Bhendi Nala, a wide river bed with fast flowing stream of water. I did not know the name and people just told us that trek is lovely and you can enjoy a waterfall. Who can resist a waterfall? Since we had gone in the monsoon, the water was gushing across the rocks with high currents but this same place is dry bed of rocks in summer. The nala fills with water from the peaks of Yeoor hills and flows into the Chena creek of Thane, Ghodbunder. This trekking route is actually closed, since people carry hard drinks and enjoy them while getting drenched in the waterfall. During summer it is a dry bed of rocks. The villagers, men and women alike walk into the forest to collect leafy vegetables and herbs. Probably they make money from it. The path was through a dense forest of red pine, bohinia, resimosa, amla, vine, nilgiri, benera, black currant, tamarind, turmeric, lotus, jackfruit, seasen, jaan plant, almond, and deepal trees. Both: the going and return journeys were very refreshing. Carry some light food with you else you may not get too much at that place. Reach the place to start trekking by 8 am. The forest officials reach this place by 9 am and they start requesting no one to trek into the forest, as a precautionary measure. People take beer bottles, drink their hear and break them on the way. Quite a lot of the path is covered with glass pieces littered around. You need to be careful. Even plastic bottles, plastic bags, Lay packet foils etc. left by unconcerned environment killers in this lovely forest. The last stop was near the Kanheri Airforce station. This place has a lovely lake, at the bottom of the mountain, with monkeys frolicking around. We can see from the top but could not see anyone around near the lake. Overall: It was a thrill to enjoy the lush green forest of Yeoor hills amidst the concrete jungle of Mumbai, an unbelievable, cherishing and rejuvenating experience.